Originally published under the title, "Why 'thief' is not just a five-letter word." 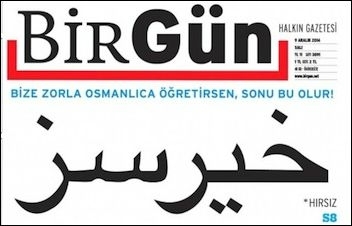 On Dec. 9, the front page of the maverick daily BirGün featured a big headline in bold letters in Arabic script. For the readers who cannot read Ottoman, BirGün explained that the headline just meant "thief." On top of the headline the newspaper's editors explained: If you forcefully teach us Ottoman this is what you get. It was a dissident newspaper's response to President Recep Tayyip Erdoğan who in early December insisted that "whether you like it or not Ottoman will be taught and learned in this country." This columnist has no idea if someone will get offended with the word and sue the newspaper. But it would be fun to read from a potential complaint to the prosecutor: "Your Honor, although this newspaper did not name any names, I am certain that it implied myself when it ran the Ottoman headline that read 'thief.'" What could only be an exaggerated joke in a sane country is finally reality in Turkey. In March, a whole police unit scanned shots taken by photojournalists at a football game to find the fans who had unfurled a banner that read "There is a thief!" A few days later, a man unfurled the same banner, "Thief!" during one of Mr. Erdoğan's public rallies. Video footage showed the man was forced by security to lower the banner before being beaten by the crowd. The man claimed he was beaten with batons by Mr. Erdoğan's bodyguards for an hour and threatened with a gun. His wounds were verified by hospital reports. Last week, a 16-year-old boy was arrested by the police for using the same word, "thief." A judge detained the underage boy for two days until another court released him. He will be tried for up to four years in jail for "insulting the president." The mighty Turkish state not only detained the teenaged boy during his school hours but also put him into custody together with adult detainees. But the funniest "thief" story award goes to a more amusing incident. Recently, a man at a public rally gathered to inaugurate the high-speed train between Istanbul and Konya was complaining to his friend that his son's stationary at school had been stolen. "Imagine," the man told his friend, "There are thieves even at that age." Once again, the word "thief" did not go unnoticed by the Turkish "Securitate." Official bodyguards detained him, and took him to a police station for interrogation. He was then sent to the prosecutor with a request for his arrest. The prosecutor – miraculously – decided that it was a mistake as the man testified that he had mentioned the word in connection with petty thievery at his son's school. The man was released but it was not the end of his nightmares. During his sleep the same night the police knocked on his door to arrest him once again and interrogate him on suspicion that he might be linked with an illegal organization. Indeed, the man had links with an organization, but not an illegal one: He was a member of Mr. Erdoğan's Justice and Development Party (AKP)! Why, really, does Mr. Erdoğan, or anyone in his circle of power, behave so prickly when someone mentions the word 'thief?' What made the pro-Erdoğan crowd at the rally or his bodyguards presume the 'thief' banner targeted the [then] prime minister, and not, say, Vladimir Putin? Or the opposition leader? 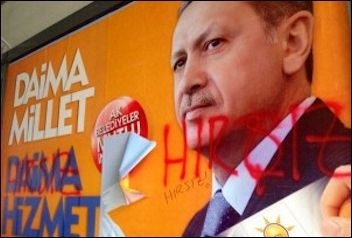 Why is [the AKP] so convinced every mention of the word 'thief' targets the prime minister? Should the word 'thief' be deleted from the Turkish vocabulary? Too bad, Google insists on producing as many as 68,300 results when one types the dangerous, five-letter word together with a certain Turkish name.